This is the first in a series I’m planning. I make Artist Trading Cards (ATCs) generally once a month to trade with my “Book Club” friends. One of the processes I like to follow is creating a background on a full 8-1/2″ X 11″ sheet of cardstock and then cutting it into 10 standard sized cards. Mirkwood Designs has a great template for getting 10 out of one piece of paper with little waste. 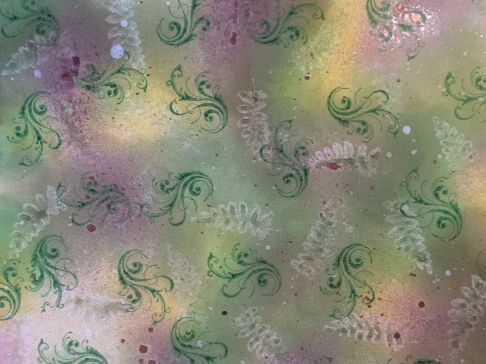 But there are so many wonderful techniques you can do to create lovely backgrounds for card bases and ATCs, that I thought I’d show a little more about my backgrounds here and explain some of the steps and variations I try. For this set of cards, I was inspired by the September issue of Craft Stamper magazine, page 38. I created the background by starting with a sheet of Ranger Specialty Stamping Paper. This paper has a very non-porous surface and is very smooth. I applied Ranger Distress inks with a sponge applicator in several of the greens. I then took the fern stamp and misted it with water. I placed it on the inked surface, which creates a ghost image. I repeated that across the page, changing the orientation of the stamp. I then stamped the flourish in Mowed Lawn randomly on the page. I then spritzed some water, some larger drops and some smaller. Finally, I missed areas with Glimmer Mist to add some additional texture. Below is what the background looked like. Once it all dried, I cut the paper into 2-1/2″ X 3-1/2″ inch cards for my ATCs. I must confess–sometimes it is pretty hard to cut up my background pieces! 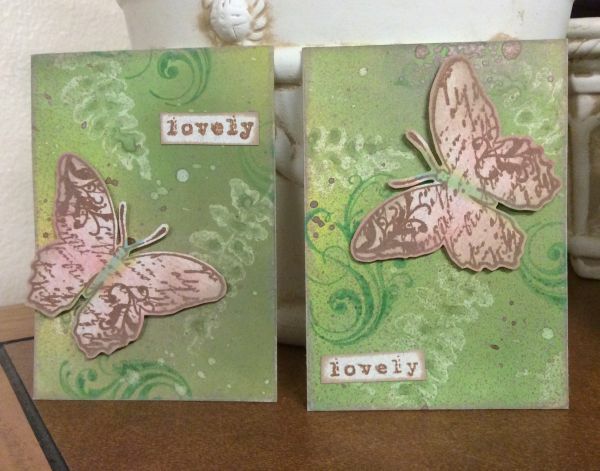 I stamped the butterfly and the word “lovely” on a separate piece of cardstock. I cut each out and distressed the stamped pieces and the outside of the cards with chalk inks. I then attached the pieces to the cards with dimensional adhesive, letting interesting places in the background peek through. Thanks for visiting today. Please let me know if you try this technique.